For someone who appreciates a good pint as much as I do, I’ve known rather little about the way it’s made. Sure, you’ve got your canonical list of ingredients: barley, hops, water and yeast. But you don’t just throw those into a pot and expect something good to come out the other end do you? Not quite, but it turns out making drinkable beer is actually pretty easy. You can brew 20 litres or so of the stuff for around $40 and 9 hours of work, and most of that is just cleaning. With a decent recipe and a bit of practice, your beer can be just as good as the stuff your favourite local craft brewery makes. U-Brew shop: opening a can of Chef Boyardee and heating it in the microwave. Kit brewing: grabbing a pre-made jar of spaghetti sauce and boiling some noodles. Extract brewing: buying plain tomato sauce and tomato paste, adding veggies and herbs, maybe some sausage or pancetta, and choosing the right noodle to accompany. All-grain brewing: just like the previous stage, only you’re starting with fresh tomatoes instead of cans. I wanted to write up a bit of what I’ve learned, but since I keep tripping over describing the process I figure it’s best to explain that up front. So this will be the first of a three-parter, the follow-up will go into more detail about what I’ve personally learned after having done it a few times, and the final post will be my own personal step by step checklists for brew day and bottling day. This really is just a basic overview of how it works, I’m skipping a lot of the details. But I also tend to take a more exact scientific approach. Other home brewers will tell you to relax and not sweat it; beer wants to be made, you’ll have a hard time screwing it up. And while they’re not wrong, I’m really not interested in spending the time it takes to make mediocre beer. I want mine to be good, if not great. If you’re like me and prefer the more exact scientific approach, you’d benefit from finding a quality book like John Palmer’s How to Brew and brush up on the hows and whys of the process before you attempt it. I can’t recommend that particular book enough, and luckily for us he even published the entire first edition in a freely available online version. If you’re not like me and would rather not worry about the little things, the more accessible Complete Joy of Homebrewing is a far better book for worry-free brewing. That seems like a lot of jargon, especially for those of us in the crowd who didn’t major in food science, but it’s really just a bunch of special names for fairly mundane things that can be bought at your local homebrew shop. Brew kettle is a fancy term for a big old stainless steel pot, and fermenters can be a plastic food-grade bucket or a specialized 5 or 6 gallon glass bottle (called a carboy derived from the Persian ḳarāba, or bigass glass bottle). Airlocks allow gasses to escape while keeping oxygen out; oxygen is the enemy of good beer. A syphon hose is just a plastic tube that allows you to transfer between fermenters and bottles. You probably already have a digital kitchen thermometer, that’ll do. A hydrometer is a plastic sample tube with a floating glass widget inside it that measures the density of the fluid it’s in, and while not strictly necessary for the actual brewing process, taking measurements at the right time will tell you how much alcohol was in the beer you just made. Of course you can buy a lot more equipment that will make your life easier during each step of the process, but those are the basics. With that list you’ve got enough to make beer. Dan’s Homebrewing Supplies on Hastings will sell you a mostly-complete kit for $70. I listed just four ingredients in the opening paragraph. Barley, hops, water, and yeast. If you’re following the Reinheitsegebot that’s all you’ve got to work with. Within those basic ingredients though, you can find tremendous variety. Malt-wise you have pale, biscuit, chocolate, Munich, Vienna, numerous varieties of crystal, and more. A few dozen hop varieties of European and North American lineage exist, all with different flavour characters and acidity ratings. Yeast comes in carefully-controlled strains from all around the world, each strain imparting its own unique character on the beer. And people will go to great lengths to add minerals in attempts to duplicate the water profiles of famous brewing towns, since water can taste very different from one region to another. But of course no one says you have to follow 500 year old German tax laws anyway. Brewers these days are experimenting with additions of cocoa, coffee, nuts, fruit, herbs, spices, and more. Which ingredients should you use? Whatever you want, of course. Your local homebrew shop can provide you with a bunch of recipes to match classic styles and you’ll find tons more online. Keeping it simple for the first batch is wise, but once you’re confident enough it’s more fun to use the recipes as a starting point and create your own combinations to match your tastes. There are two major recurring themes during the brewing process: you need to keep every piece of equipment that will touch the beer germ-free, and as best as possible you want to avoid introducing oxygen into your beer. So before even starting the very first step is to clean and sanitize all your gear that will come into contact with your ingredients. You’ll do this an awful lot, it’s where most of your brewing time goes. Making beer would be so much simpler if we didn’t care about quality. Your local shop will have a variety of sanitizers, but one I’ve found to be minimal hassle is a no-rinse powder that requires 30 seconds of contact and breaks down into hydrogen peroxide. Let’s any assume equipment mentioned from this point on is clean, sanitized, and ready to go. Brewing basically means boiling malt and hops together in a pot for 60 minutes and then fermenting. 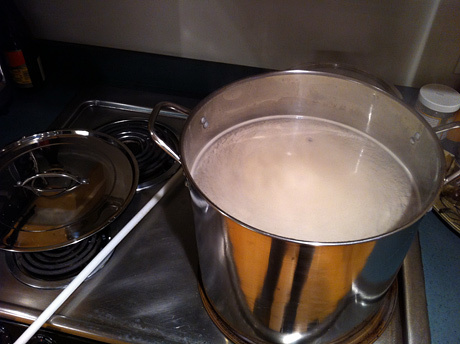 You start by boiling your kettle full of water, then drop in the malt extract and bring this malt + water combination (called wort) back to a boil. Set the timer to an hour right at the boiling point, and add your first batch of hops if the recipe calls for it. 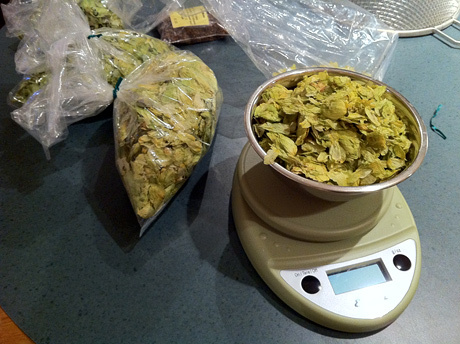 Various recipes will need multiple hop additions over the course of the hour; those added at the beginning contribute more bitterness, while the ones near the end contribute more flavour and aroma. After killing the heat, the trick is to rapidly chill the wort as quickly as you possibly can. There are expensive pieces of equipment to help accomplish this, but my method of choice has been dunking the kettle in an ice bath in my kitchen sink. Ice packs work great since they won’t melt as quickly as ice cubes. The goal is getting it down from boiling to room temperature in under a half hour, but if you can’t accomplish this it’s not a big deal. Your beer will just be hazier, that’s all. Once the wort has chilled, it’s time to transfer to the primary fermentor. You’ll still have leftover hops floating in the mix, so use a strainer to filter them out. This is the one time you want to introduce oxygen to the beer since the yeast need plenty of it for a proper ferment, so make sure to splash it around as you pour. If you need to top up the fermenter to make 5 gallons of liquid now is the time to do it. It’s also time to take an initial reading with the hydrometer. Fill the sample tube and drop in the hydrometer, giving it a spin to clean off any bubbles. Once it stabilizes, check where the top of the liquid meets the scale and that’s your Original Gravity. Common ranges for lighter beer are between 1.035 and 1.050, while heavier and much higher-alcohol beers will range from 1.050 to 1.100. Brewer’s yeast is different from the stuff you’d make bread with. You can get it in both dry and liquid forms; dry yeast is definitely good enough for the first few batches. If you’re sure you’ve got a fresh package that’s been stored at a nice low temperature, you can just dump it right in to your primary fermentor. After you’ve added the yeast (also called “pitching”), seal up the primary and make sure the airlock is firmly in place. 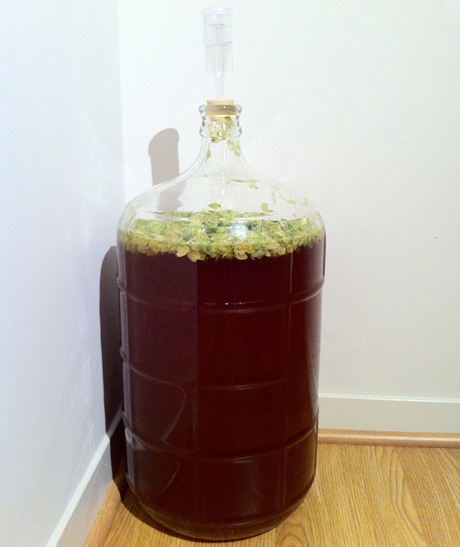 Fill the airlock with sanitizing solution to ensure bacteria doesn’t creep into your ferment. Now it’s time to wait. Different types of beer call for the ferment to happen at specific temperatures; lagers need to be fermented cold (13 C or lower), while ales are best done warmer (19 C). In the winter this basically just means finding a cool dark place to stick the fermentor and letting it go. The more control you have over keeping the temperature steady, the better the beer will turn out. In a day or so you’ll start seeing bubbling in the airlock. In two days the bubbling will be furious and you’ll notice a slight smell if you get close to the airlock. It’s not a bad smell at all, like a rising bread but sweeter. After three or four days the bubbling will slow down and eventually stop completely. Give it another day or two once all bubbling has ceased, and you’re pretty much done your primary ferment. Take another hydrometer reading for your Final Gravity. You should have dropped to 1.010, give or take five points. (If you’re significantly higher, your yeast may not have finished doing the job. It’s time to search Google for remedies to a “stalled ferment”.) Plug the OG and FG into an ABV calculator like this one to get your final alcohol percentage. Yep, it’s that easy. Right about now you actually have beer. Go on and have a sip. It’s not great, it still needs time to condition properly so it’s flat and yeasty, but this is when you start getting a sense of what your final beer might taste like. This is when you can transfer your beer from your primary fermenter to a secondary. It’s not essential to do this, you can leave your beer in the primary too. If you decide to transfer, move your primary to a counter or raised position (it helps to raise it a day before and give the yeast a chance to settle) and stick one end of the syphon into the beer, with the other all the way to the bottom of your secondary fermenter down below. Get the syphon going and make sure the exiting beer is under the rising surface at all times and slow down the flow if it starts bubbling or splashing. Eventually the level in the primary will get near the bottom; carefully tilt one edge up to try and get as much beer as possible, while leaving behind the yeast cake at the bottom. If your recipe calls for dry hopping, this is when you’d add them. Tie them up in a sanitized bag if you have one, or just dump them straight in if you don’t. Either way, pop on the airlock and then let the secondary sit for a couple of weeks. At last, it’s time to move from fermentation to the final product. I don’t have the room to store a keg so I can’t tell you much about that; from what I gather it’s a darn sight easier than bottling. 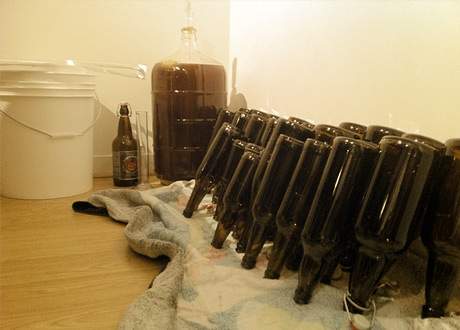 But bottling is more accessible because your empties pile will do fine after a bit of scrubbing. The key is non-twist off bottles. The larger the better since you don’t have to fill as many. If you have a growler or two on hand, or any of those one litre Howe Sound swing-top bottles, they’re gold because they make capping easier. The first step to bottling is another transfer; just like the move from primary to secondary, you want to transfer from your secondary to a bottling bucket (which can easily be the same one you used for your primary) in order to leave behind any residual yeast and hops. At this point you add some priming sugar to provide the yeast food for building up carbonation in the bottle; different types of beer call for different amounts, but the safe rule of thumb is 3/4 of a cup of dextrose is good enough for a 5 gallon batch. From the bottling bucket, start the syphon again but clamp it off once the beer is flowing, and get a bottle under it. Open it up, fill the bottle carefully to avoid bubbling and aeration, and then cap it. Capping requires fresh caps from the homebrew store and a special device, either a hand-held lever capper that takes a bit of elbow grease, or a sturdier bench capper that’s more expensive but more effortless and precise. Pop on the cap, seal, set the bottle aside, and keep moving down the line till you’re out of beer. Then here comes the tricky part: you have to wait. Put the bottles in a darker place at room temperature, and give them two weeks or so for the carbonation to build up. You’ll inevitably crack and drink a few in the meantime, but the ones that are stored longer will condition more and produce better carbonation. I’ve found the trick is to have an old batch still around while you wait for the new one to finish. And there you have it. Your own beer! Wow, Dave. You make me want to go brew my own! Then again, maybe I’d rather just drink yours! When do we get to sample some? Holy cow. This is amazing. I can’t wait to try your beer Dave. And I’m looking forward to “Part 2”!